I've looked at Time4Learning many times over the years we've been homeschooling. All of my children enjoy computer games, and I thought it looked like fun. They offer curriculum for preK through middle school, and even have brand new high school levels. Subjects include language arts, math, science (beginning in 1st grade) and social studies (beginning in 2nd grade). You'd need to add handwriting and reading practice. I was excited to have the opportunity to review the 1st grade curriculum with my son, who is 6. For the purpose of the review, I received a 6-month subscription to the 1st grade level to use with him. I put Isaac in the 1st grade level, because when I read the descriptions of the work required, I thought like he should be able to handle it. However, he had a hard time with some of the initial activities. There was one that required him to hit the space bar when a moving line went across the correct sight word. He didn't know the sight words and was frustrated by the activity, even after I helped him figure out how it worked. The great thing about Time4Learning is, if your child needs to work at a different grade than they're signed up to be in, you have access to one level up and one level down from their current grade. He did fine with 1st grade math, but needed more practice with reading before being able to do the 1st grade reading activities. He did manage some of them, but overall, he was better suited with the kindergarten level in that area. Isaac has really enjoyed using Time4Learning. He asked often to watch "the blue mouse," and chose which games he wanted to play. I had hoped he would be able to work independently, and as he got more used to how things worked he could to some degree, but since he was in the 1st grade level I did need to sit with him and explain things sometimes. Obviously, that's not the end of the world, but it didn't accomplish what I'd hoped, and that was to keep him busy while I worked with my 2 older girls. Time4learning offers a lot of great resources for parents. Check out a demo for any level here. You can see an overview of the subjects they offer and how many activities there are per topic. They have printable lesson plans, and you can print a list of completed activities with your child's scores, so you can see their progress. They also have timer settings. 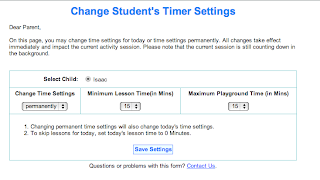 You can choose the minimum length you'd like lessons to be, as well as set a timer for the "Playground," which is an area where kids can play games just for fun. 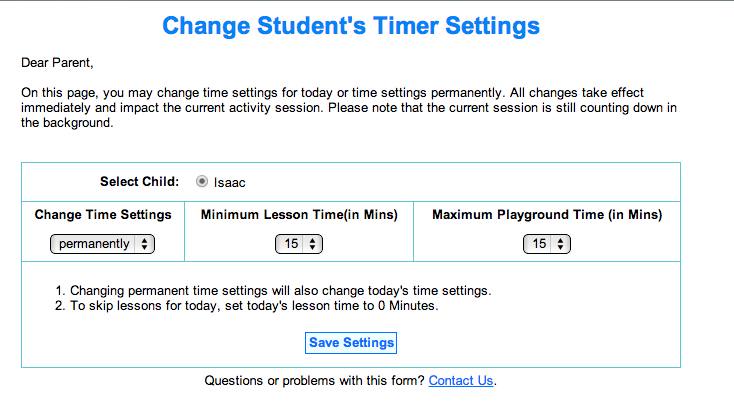 If you set your lesson time for a minimum of 15 minutes, your child must work for 15 minutes before they can get into the playground section. It's also completely flexible. You can work on things any time, and anywhere you have internet connection. That's a huge plus when homeschooling! It doesn't require having large piles of books around, which I could see helping someone living in a small space or who needed school to be portable. One thing I learned from their FAQ, which I thought was worth noting, is that as a curriculum provider, they cannot be accredited, but their curriculum is used by accredited schools. Their printable pages can be included in a portfolio for your student, if you're in a state that requires that. As I've mentioned, Isaac had a good time with Time4Learning. I can see this being a good fit for people who work from home, or even away from home, so their children can still be at home too. For us, it's a fun supplement. I love to have him learn while playing games, because it can be tiresome for a small boy to be "told what to do" all the time. I do prefer real books and math manipulatives he can hold in his hands. I want him outside more than I want him in front of the screen. The games are fun, but for us to use this as our primary curriculum would require far too much screen time, in my opinion. Time4learning.com is available for $19.95 per month for your first student (PreK-middle school) and $14.95 per month for each additional student. The high school curriculum, which includes 4 courses, is available for $30 per month. For a 9-month school year for Isaac, that would total almost $180. That's really not bad! Click here to read more reviews from the Schoolhouse Crew! Great review! My son had that very same "Bob the Builder" comforter! LOL My kids have been using T4L for several years now. Great review! My kids have been using T4L for several years now.